New Taipei Deputy Mayor Hou Yu-ih (left). Taipei, May 18 (CNA) A television series produced by the New Taipei City government that gives Taiwan's new immigrants the chance to tell their own stories and obtain valuable information will be launched at 9 p.m. Sunday. 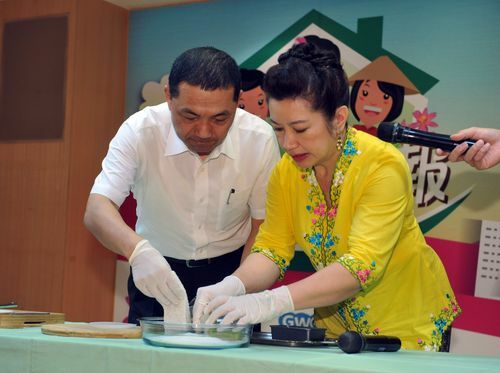 "New immigrants are valuable assets of Taiwan, and the city has always valued them, offering them diverse services early on," said New Taipei Deputy Mayor Hou Yu-ih (侯友宜) at a press conference to promote the program. Among the services the city provides are courses for children on the native languages of their parents, programs for parents and children to read together, employment assistance, help on starting their own business, and general counseling, Hou said. This year, the city had new immigrant groups plan a television series with content they truly need and worked with 11 cable operators in the city with expertise in filming local issues to produce the shows in Chinese, Thai, Bahasa Indonesia and Vietnamese. The series, which will consist initially of 12 episodes, hopes to provide new immigrants information related to life and work in their own languages that they can more easily absorb and understand. Lin Chieh-yu (林芥佑), head of the city's Information Department, said the department has called on new immigrant groups, such as 4-Way Voice, TransAsia Sisters Association, Taiwan (TASAT), and the Taiwan International Family Association since last year to get ideas for the show. It has also asked Karen Hsu (徐瑞希), head of the Global Workers' Organization, to coordinate an editorial desk that will unearth more stories that focus the spotlight on new immigrants. Lin said the new series will be aired at 9 p.m. on Channel 3 every Sunday. The half-hour program will be aired first in Chinese, then rerun in Thai, Bahasa Indonesia and Vietnamese in that order until 11 p.m. The same 30-minute program will also be rerun in Chinese on Monday, in Thai on Tuesday, in Bahasa Indonesia on Wednesday and in Vietnamese on Thursday. The program will also be uploaded to the Internet to enable new immigrants to watch it on their cell phones. Note: the shows will be shown by cable operators in New Taipei and will be put online after broadcast. The link to the videos will be available on May 24.